Autumn is a wonderful time of year, full of falling leaves and fun activities. You can use our free printable Halloween gift cards for many different things. We have many fun designs to pick from and you can use them at work and around the house, too. 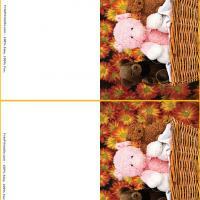 Add them to inbox and outbox folder holders and bring some seasonal fun to your workplace. You can use them as name tags at your next work function if it happens to fall before Halloween. 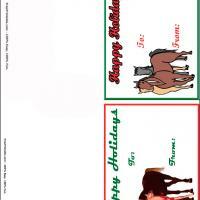 We have many other printable cards you can use for upcoming holidays as well. Make sure that you check back here at FreePrintable to keep up to date with our latest additions. We have many different printables and activities for any time of the year. They are a great way to save time and money. 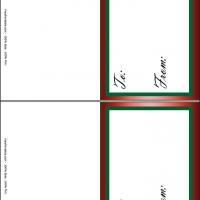 Use many of our different gift card designs to make tags for all of your presents from Christmas to someone’s birthday. If you are planning on having a Halloween party this year, check out all of our great ideas for everything from cards to recipes. 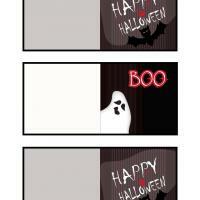 These great printable gift cards can serve many purposes at your Halloween party. Use them as name tags for all of your guests, especially if you are having a spooky costume party. You can use them to label your refreshment table to make sure everyone knows what drinks and foods they can choose from. If you are handing out raffle tickets for people to win prizes, these free printable cards will make a wonderful and affordable substitution. Do not forget that you can use them on goody bags as well. You can print them on plain white paper, or colored paper to match your color scheme for the party. You can have fun and achieve a professional look without having to spend a lot of money. Sometimes it can be hard to find party goods that are not too spooky or bloody for a child’s Halloween party. These free printable gift cards feature a funny ghost and cute looking bat without going overboard on the blood and gore. Kids will love seeing these at their party. You can use them to label activity tables and as name tags for all the guests. This can really come in handy if your child has made lots of new friends, or if their costumes make it hard to identify who they are. 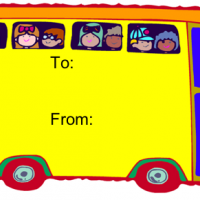 Our printable cards are free for you to use, so you can print out as many as you need.